Sun-dried from the environmentally protected national treasure, Ise (ee-say) Bay, Japan. Essential for miso soup and delicious in salads. It turns a happy bright green when soaked. A good source of magnesium. Eden Wakame is cultivated off the shores of Ise (ee-say) Bay, Japan where it thrives in cool and mineral rich arctic currents. The sea there is surrounded by National forests and mountains and is known as the 'Ocean by Mountains' area. Rivers nourish the bay adding to a mineral rich environment. This area leads all of Japan in ecology movements. Development is forbidden to ensure future generations the legacy of this famous edible seaweed resource. This wakame is hand harvested from January to the end of April by farmers in boats using long poles with blades attached to cut the fronds loose from the ocean bottom. Long rakes are used to gather the wakame as it floats to the surface. The wakame is taken ashore, washed, hung on ropes and left to sun dry before trimming, grading and packaging. Unlike most commercial wakame, Eden Wakame is not treated with softening agents such as enzymes or monosodium glutamate (MSG). Wakame Undaria pinnatifida is a species of brown algae with long, delicate leaves that resemble feathers. Its size and tenderness varies depending on where it grows as temperature and ocean conditions create a variety of plants. Wakame first became known in the United States as the green in Miso soup, and is one of the most popular sea vegetables in Japan and the United States today. Eden Wakame is quickly restored to tenderness when soaked and is a favorite in soups, stews, marinated dishes, and salads. 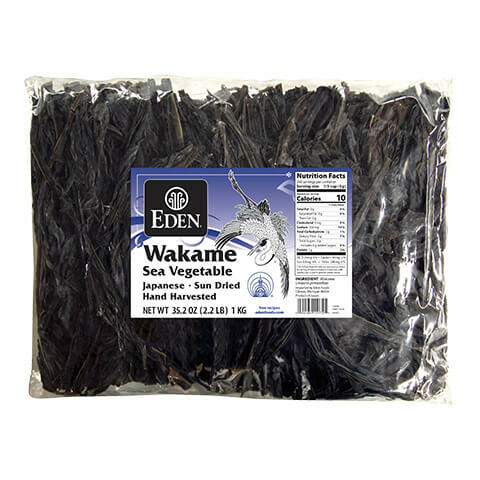 Eden Wakame is low calorie, fat and cholesterol free, and a good source of magnesium. Like kombu and other brown algae, wakame contains glutamine, a sweet amino acid that acts as a flavor enhancer and softening agent when cooked with other foods. Its alginic acid, a polysaccharide similar to pectin found in land plants, protects the plant from bacteria and fungi. Scientific research conducted by McGill University, in Canada demonstrated that "alginic acid binds with heavy metals in the body, from all sources, renders them insoluble and causes them to be eliminated."